Pepper Lim reckons his mom would do a hell of a job managing Malaysia’s contracts – and Lord Bobo agrees. If Ah Ma bought a bottle of ink, went home and drew a picture and found out the ink faded after a few hours, what do you think she would do? Do you think she would just say, “Ah well, that’s just my bad luck!”? You can be sure she would take the ink back to the shop and ask for a replacement. If the shopkeeper explained that that particular brand of ink faded after a few hours, she would then ask for a different brand. Why wouldn’t she if the ink did not do what she intend it to do? What do you think Ah Ma would do if she bought RM10 million worth of ink and it did not do what it claimed it could do? That’s right, she would get a full refund! But that is not what happened to RM10 million worth of ink the Elections Commission (EC) bought for the 13th General Elections (GE13) this year. The ink was supposed to be indelible. It should stain a voter’s finger for seven days. It was supposed to stop a person from voting more than once. 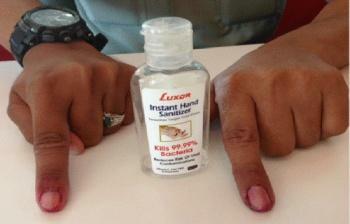 On polling day, many voters showed that the indelible ink could be washed off with soap and water. One voter even demonstrated that the ink could be wiped off with blades of grass outside the polling station! Guess what explanation the EC offered? The deputy chairman said, “The supplier sent what kind of quality, we don’t know.” He doesn’t know! 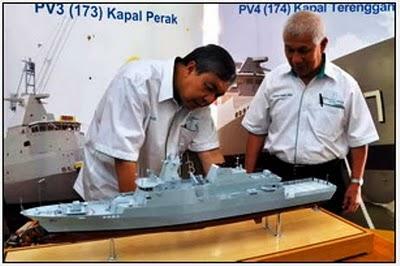 After spending RM10 million, he doesn’t know! If Ah Ma had been the person in charge of purchasing the indelible ink, you can bet she would take immediate action. The ink should stain a finger for seven days but it was washed off; who is at fault? Is it the fault of the Quality Control person who received the ink? Or is it the fault of the manufacturer who supplied the ink? Either way, someone’s head would roll! For RM10 million, you can bet Ah Ma would make sure she gets her RM10 million back! Unfortunately, not the EC. They came up with excuses and reasons why the ink they bought did not do what it was supposed to do. This kind of tidak apa attitude is rampant in our government. Nobody seems to care about the high corruption, the large amounts of money wasted or the mismanagement of public finances. The roof of a stadium collapsed? Tidak apa lah! The roofs of two stadiums collapsed and the MACC could not find anyone responsible for it. However, a confidential investigation report by the Public Works Department cited the collapse was due to “serious engineering flaws, shoddy workmanship, inferior materials and lack of expertise”. There! Isn’t that enough to get heads rolling? If Ah Ma was in charge, the headlines would be so different. 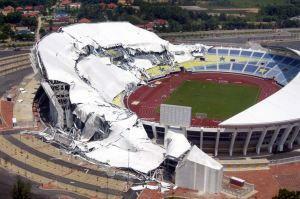 Especially so when five people were injured in the second roof collapse of the same stadium. How long more can our country accept such tidak apa attitudes within the governing circle of our country? More importantly, how long more can we afford to? In my opinion, such corrupt practices should have been curtailed some 20-odd years ago. Our national debt doubled in seven short years from RM216 billion in 2004 to RM437 billion in 2011! If a publicly listed company faced such debt, their first business of the day would be to slash costs and increase profits in order to close the debt. However, no one in our government seems to know this! At an UndiMsia Chats session, someone asked our guest Idris Jala to comment on the overpriced binoculars bought by the Marine Parks Department. They had paid RM56,350 for a pair of binoculars that cost not more than RM1,940! Idris replied it was standard procedure for tenders to be approved based on the total tender price. That means, if a tender which includes some ridiculously priced items such as these binoculars which are 28 times more expensive, the buyer will still go ahead to approve the tender as it is “part of the package deal”. What nonsense! If Ah Ma had been the purchaser approving the tender, you can bet she would go through the items in the tender with a fine-toothed comb. You know what she is like; every dollar she saves is a dollar she can spend somewhere else. If she had found the overpriced binoculars in the list, she would immediately call the supplier to inform him. Was it a typo? Maybe the supplier had put down the wrong price by mistake. If it is, the supplier will be grateful for the correction. Was it an overpriced quote? Again, the supplier would be grateful for Ah Ma to point out that his binoculars were not competitively priced. If the supplier’s binoculars price is not corrected soon, he will lose other tenders. Either way, the supplier would be grateful to Ah Ma. One, approve the tender without the binoculars. She would tell the supplier, “I will approve your tender on condition you remove the binoculars. If my boss found out I paid so much for them, I will get into trouble.” Then, she only has to simply purchase the binoculars from another supplier who is selling it at the correct price. Two, do not approve the tender and talk to the second lowest bidder to negotiate a better deal. Only a fool would be taken for a ride by his own supplier! The Golden Rule: He who has the gold makes the rules! Is there a lack of suppliers who are willing to participate in large government tenders? Certainly not! I think there is a lack of government officials who are willing to use their heads and time to do the best job they can. Either that or they are in cahoots to cheat the rakyat’s money for personal gain. There, don’t you think Ah Ma should be in charge of government spending? Dear Paprika, our country is a very rich country. If managed well, we can also hold our heads high and ride the triumph of having turned our third-world status into a first-world status just like the tiny island of Singapore did. Posted on 30 May 2013. You can follow any responses to this entry through the RSS 2.0. I agree, put your Mum in charge. I would dearly love to be able to supply the Malaysian Government. It sounds like such a forgiving type of institution – shoddy goods are ok and overpriced goods are not a problem. Now, I wonder if I can just get paid for the invoice but not worry about the supply part. Back to the ‘Indelible Ink’ topic. I has a very good laugh in a very long time, at least I laughed hard at the official answer given. The ink needs to be shaken. Fact : Aqueous Silver Nitrate of any concentration do not need to be shaken before use. The ink will last 7 days without any curing. Fact : Silver Nitrate (AgNO3) will need to be properly cured by exposing it to any light source to achieve maximum duration. More light (LUMEN) equals longer duration, but subject to concentration of AgNO3. The ink needs to be applied in multiple layers. Fact : AgNO3 will not make any (black) stain any darker. It will just turn black. AgNO3 is carcinogenic to the kidney. Fact : AgNO3 according to Material Safety Data Sheet (MSDS) is only dangerous to the lungs and mucus membrane is taken orally. Slightly hazardous in case of skin contact. Toxicity to Animals by oral means is 1712 mg/kg. (Meaning 1 gram of AgNO3 versus 1 kilogram in body weight). An adult weighing 50kg will have to consume via oral means, 50 grams of AgNO3. FACT : AgNO3 (CAS # Number = 7761-88-8) can be easily washed off if you know how. You can use a liquid called FIXER, easily obtained via photographic shops all over the world. The active ingredient is a solid-transparent-odorless-cyrstal called ‘Sodium Thiosulffate”, exactly like ‘Paracematol’ in Panadol. The next solution is by using “Iodine” with “Potassium Permanganate”. The easiest solution is by using “Sodium Chloride” or the common salt! How do I know these stuff? I have personally handled AgNO3 of high purity for years and managed to wash off the stains for years, not at first but it gets easier when you understand the truth. Very interesting. Can you write a more complete article and I post for you?